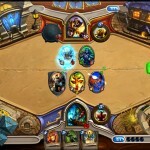 A Look at Hearthstone, What’s it About? Some of you may have heard about the new Blizzard card game “Hearthstone.” I kind of forgot about it until a few days ago when I ran into this video that shows some of the deck building and a few online games. It looks really great so far. I’m hoping I can get a beta key soon so I can start streaming it on twitch, but until then there’s videos like this and other streamers. Here’s a great video overview of the game by TotalBiscuit. Creating decks in Hearthstone is fairly straightforward. But you can’t just walk in and put any pile of cards together and expect it to be able to compete. First you select the class you want to play. You are then restricted to only use the cards that belong to that class along with cards available to all classes. Just about all of the cards in Hearthstone can be divided into three major categories: Removal, utility, or minions. Most well rounded decks will feature elements of all three.